As thousands of chocoholics and foodies gear up for the highly-anticipated return of the biennial Hans Sloane Chocolate & Fine Food Festival, outstanding chefs from Northern Ireland and further afield are joining up with festival organisers to ensure that the three-day festival offers a foodie experience not to be missed. With the addition of Downpatrick’s Finnebrogue Artisan this year as the festival’s overall sponsor, Finnebrogue consultant development chef Chris Burt will lead the charge with an innovative line-up of chocolate and locally-focused food activities to span the entire weekend. Kicking off with the Hans Sloane Chocolate Ball on Friday 23rd September, Chef Burt will join up with legendary Northern Ireland chef Simon Dougan of Yellow Door to present a meal that will have guests buzzing for years to come. Utilising the finest of hyper-local produce including Finnebrogue venison and sausages, locally farmed vegetables, eggs and butter, and even reindeer moss foraged personally by Chef Burt from the Finnebrogue Estate, this dinner will highlight the wide range of world-class ingredients available from across Northern Ireland. As a dramatic end to the evening, Chefs Burt and Dougan are brainstorming a show-stopping dessert which will act as homage to Sir Hans Sloane – the Killyleagh-born physician, naturalist and collector credited with bringing the recipe for drinking chocolate back to Europe –and turn heads as the extraordinary chocolate dessert is unveiled to guests. The festival will continue on Saturday and Sunday, 24th and 25th September. 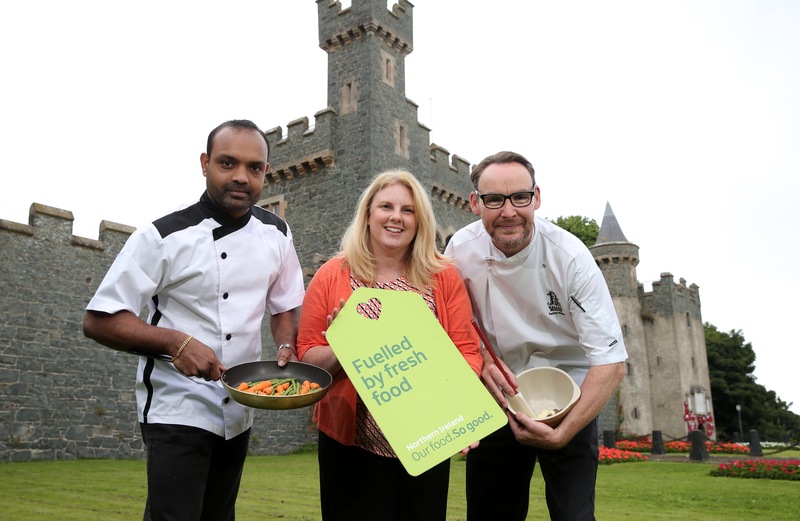 Guests at Killyleagh Castle can enjoy live cooking demos led by Chef Burt alongside leading local chefs including Chefs Danny Millar, Balloo Inns; Roy Abraham, The Smuggler’s Table; and Fernando Correa, Quails at the Gallery, among others hosted by Food NI. Incorporating locally-grown and sourced produce paired with chocolate elements and even a chocolate stout from local Mourne Mountains Brewery, these chefs will bring home the theme of local cooking with a touch of chocolate in honour of Sir Hans. “In addition to the live kitchen demos on Saturday and Sunday, 24th and 25th September, guests will also enjoy tasting freshly-made dishes and treats from over 30 local artisan producers including Great Taste Award winners S.D. Bells, Deli Muru, Abernethy, La Coquine, Glastry Farm Ice Cream, Finnebrogue, Krazi Baker and Mash Direct, among many others,” added Meave. Aine Kearney, Director of Business Support and Events Tourism NI commented, “Tourism Northern Ireland is a proud sponsor of the Finnebrogue Artisan Hans Sloane Chocolate & Fine Food Festival, in line with the Northern Ireland Year of Food and Drink initiative, the festival is showcasing our unique chocolate offering. Ticket prices vary, based on events running throughout the Festival. For further information on all events taking place and to book tickets visit http://www.hanssloane.com or follow the Killyleagh Chocolate Festival on Twitter @KillyleaghChoc or facebook.com/KillyleaghChocFest.